Take ½ fresh coconut, cut into small pieces, add ½ cup water and warm the water. Close the bowl and leave it for about 15 minutes. Mix it in the mixture. Strain the milk into the sieve. Use this milk for kneading the dough. Take maida, rava, sugar, baking powder and mix it well. Add butter and mix it well. Knead the dough with coconut milk. Use the milk as required. Make a soft dough like roti dough. Make four big balls. Take 1 ball, roll into about 8-9 inch diameter big roti. Cut into long strips of about 1 inch thick. Take one strip, cut from both the sides, make small rectangles of about 2 inches. Take one rectangle, press from the centre to make a bow like shape. Prepare all the bows like these. When you are half way through you can start frying or can complete all the bows and then fry it. Take a frying pan and heat oil. Start frying on a low flame in small batches. Let it cool. Keep it in an air tight container. This is one way of making kalkals. You can even make a rectangle, take a fork, press it and slowly roll it. Generally, eggs are used as one of the ingredients but I have tried it without it. I got this recipe from my friend. 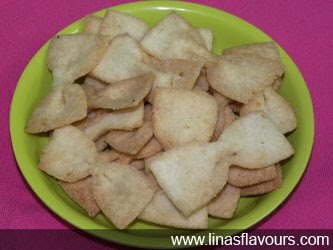 If you feel this is very difficult and time consuming, you can have your own shape or just do small puris. I even thought the same before making, but it is worth doing. Importance is of the taste, not the shape.